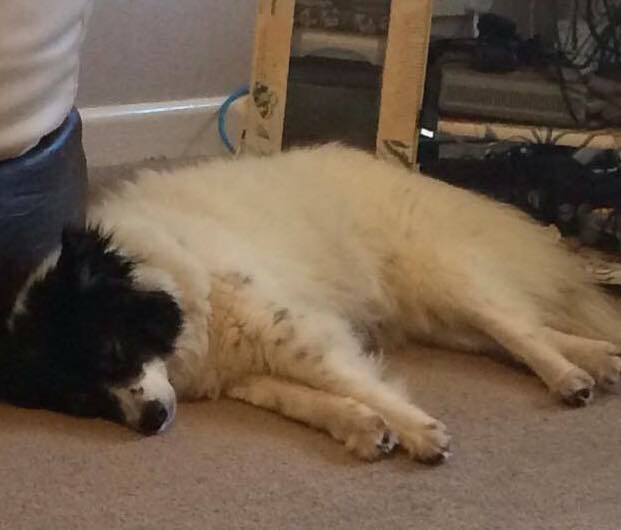 Home / Reunited Dog Stories / Reunited Raccoon…update from owner. Thank you to everyone who shared her Facebook post, joined her group, talked to a neighbour, told their friends and family, stopped a dog walker, put up a poster, handed out a flyer… It was this crucial, ground-level awareness work that meant Raccoon was recognised when she showed herself. Thank you to our friends who came and helped us go door-to-door in sighting areas and beyond. This was absolutely essential for getting the sightings in on Saturday and Monday, and we never could’ve covered as much ground without you – see map below for all the streets we covered by the time she was found. This was a lonely and emotional job by yourself – believe me, I did it all morning on Monday – and your support on the way round was invaluable. Thank you. Andrew and Tina Makinson, Will Reed and Amy, Cynthia, Sarah Pattison, Paul Jordin and Ceri Hutton. Thank you to everyone who went out looking for Raccoon. Some of you are friends, some of you are people we’d never met before, but who took it upon themselves to head out at all hours to keep a gentle eye out for her. People even drove to Ulverston from other parts of Cumbria to help. We were amazed. Thank you to the TWENTY-TWO PEOPLE who rang or messaged us yesterday to say Raccoon was on the railway line or when she was in the park. Thanks also to Jasmine Campion, who continued to keep watch from her workplace window and sent me pictures of Raccoon’s exact location multiple times. Thank you to Paul’s mum and dad, Tina and Andrew, who spent two solid days with us going door-to-door and putting up posters. They also fed us sandwiches, cake and tea at a time when our self-care was pretty poor. Thank you to Paul the taxi driver from Priory Taxis, and his very accommodating passenger (! ), who spotted Raccoon in the Honeypot at 1:30am, drove round keeping tabs and phoned us. This was our first sighting and we were so relieved to hear she was ok. Thank you to the team at Ulverston station for alerting their drivers and stopping a train for us (sickeningly worrying times). Thank you to the amazing Chris Walker from the Incident Response Team who drove us to an access road to the line, and then stayed with Paul for the next four hours while Ceri and I were on the other side of the bridge with Raccoon. We are very grateful for your support in these difficult hours. Thank you to the people who live in the house next to the bank where she was found, firstly for forgiving my mad and silent gesturing of “look the other way! Don’t look at the dog!” as they walked across the bridge (binoculars action, emphatic pointing), and for popping out to offer us a cup of tea. Thank you to Paul Jordin, who went to Barrow to buy us ink, paper and laminating pouches for the Poster and Flyer Production Station (aka our living room). Thank you to the still-secret hero who dropped off 4 portions of veggie chilli and 4 portions of veggie fajita mix outside our front door on Sunday night. 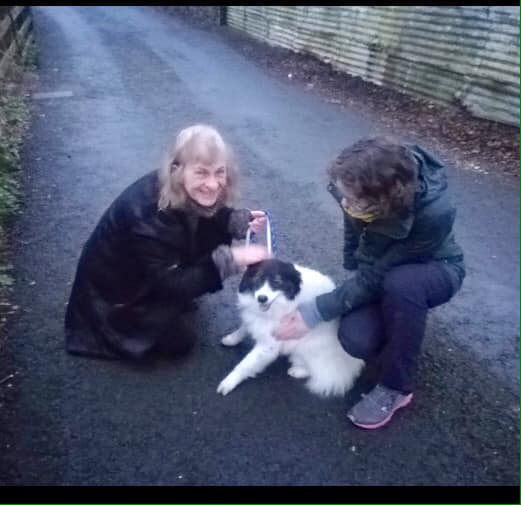 Thank you to Lorraine Benson and her husband, Carl, who shared their own experience of losing their rescue dog, Aris, and led us to the location of a trap we could use. We didn’t end up using this, but we have decided to repair it and keep it as a resource for anyone else in Cumbria in their hour of need. Thank you to Jenny Holden-Wilde, Suzy (from the Coro), Eddie and Ceri for providing us with wildlife cameras to monitor feeding stations. Thank you to Emma Maw on Lund Terrace for letting us trail a horribly potent mix of chicken, sardine and garlic juices all the way up her garden path and into her back garden when we realised Raccoon was moving through this area🤢. I promise never to do this again. Thank you to Lucy on Devon Terrace for spotting Raccoon in her garden on Monday morning and bravely offering to let us do the same to her garden path! Finally, thank you to Ceri Hutton. Our wonderful friend spent not one, not two, not three, but four hours sitting and lying on a damp, thorny bank at the side of a railway line last night, gradually moving ever closer towards Raccoon. Her patience, gentle manner and experience with rescue dogs put Raccoon at ease enough to eat the food we’d brought for her, allow herself to be stroked and then, finally, have a slip lead put over her head. Ceri has always been a great source of advice to us on all things ‘dog’, but this really was second-to-none. Honorary Godmother for sure. Thank you doesn’t even begin to cover it. We are forever indebted to you all for your support which, to be honest, we couldn’t really understand. We have always loved our community, but this takes it to another level. If you spot us out walking with her (she might be a bit of a local celebrity now! ), please do come and say hello to us – and maybe Raccoon, if she’s feeling brave. Great story, wonderful people. So good to read of such kindness and empathy when all too often stories of cruelty abound. Time for a big party!